"Texture is the fabric of my life" there is no place for static, smooth surfaces. I try to put some of that texture into every piece of fabric that I create. Each creation literally takes place from the ground up. I live in an 1850 log farmhouse, near Ottawa, where I raise fine-wool Polwarth sheep. These super-fine fibres are sheared on the farm and sent to a spinning mill for processing according to my exact specifications. Colour is of particular importance to me. I am intrigued by the interaction of colours with each other and weave structures. As I can dye my own colours, I have a very special feeling of how a colour is made up and what it will work with. My dye palette includes over 800 colours, many of which are woven into my fabrics. With my sound knowledge of yarns, colours, design and weave structures, I create specialty handwoven skirt, jacket and coat fabrics for both men and women. I currently work closely with several dressmakers, tailors and designers to create the perfect garment for my clients. In 1987 I developed a unique fabric "Mohair Feltknit" which was featured in Spin.Off magazine, Interweave Press, USA. This fabric is similar to waadmal cloth, but much more flexible as the base fabric is machine knitted. The fabric is then felted, cut and sewn into jackets and vests. I own and operate "Canaan Mohair", which sells the products of my farm - fleeces, lambs, yarns, knitted sweaters and woven garments. I also teach regular spinning, dyeing, and weaving classes in my studio. In 1991, I received an Ontario Hand Weavers & Spinners Master Spinners Certificate, 'With Distinction', upon presenting a thesis "Fleece Preparation Methods and Their Effects on the Resultant Yarn"; and am currently completing the Master Weaver Certificate Program, St. Lawrence College, Brockville. 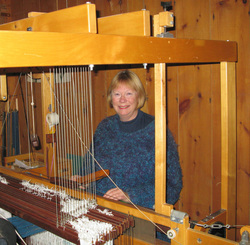 I have been weaving and spinning since 1978 and shepherding since 1980. My work has been exhibited in Ottawa, Kingston, Guelph, Toronto, and Washington and have won several awards of excellence. My one-of-a-kind garments have been sold to clients in San Francisco, New York, Memphis, Atlanta, Japan, Germany and across Canada. I have published several textile-related articles in Canada and the United States, and lecture and teach extensively. I was chosen eight years running as one of Chatelaine Magazine's "Celebrity Experts" at the Creative Sewing & Needlework Festivals in Toronto, Calgary and Edmonton where I taught knitting, finishing & designing techniques. I am currently a dye consultant for textile conservators at the Museum of Civilization, the National War Museum and Parks Canada. Although I am primarily interested in fashion fabrics, I also enjoy weaving "art" or decorative pieces in a variety of materials. Thanks to the Ontario Hand Weavers and Spinners Education Programmes, I have an extremely well-rounded spinning, weaving and dyeing background enabling me to work with any fibre for any purpose.